Frau Möller (Mrs. Möller) is an old restaurant and pub in St. Georg. In the Lange Reihe especially, where it is located, you’ll see lots of trendy, hipster new restaurants, but Frau Möller really sets a contrast to this. The owners were able to keep the comfy, cozy and also down to earth atmosphere the pub has had all the time. Rustic wooden furniture, casual, relaxed and friendly waiters, fair prices and most of all, the restaurant is usually crowded with guests and the atmosphere is great. By the way – the name Frau Möller was the name of the first owner’s dog. Whenever I go to Frau Möller, I always order the same dish – their labskaus. Labskaus is a typical Northern German meal that used to be prepared for the sailors who couldn’t eat solid food anymore due to scurvy. 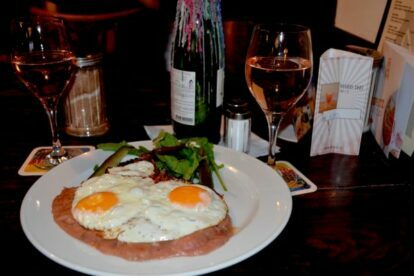 It is a mash mainly prepared with potatoes, corned beef, beetroot and onions and comes with pickles, white herring, beetroot and fried eggs. I have to admit that it doesn’t have the tastiest look, but you should definitely give it a try if you want some typical Northern German food!